Growing up in the high desert of California, Jim Doty was poor, with an alcoholic father and a mother chronically depressed and paralyzed by a stroke. Today he is the director of the Center for Compassion and Altruism Research and Education (CCARE) at Stanford University, of which the Dalai Lama is a founding benefactor. But back then his life was at a dead end until at twelve he wandered into a magic shop looking for a plastic thumb. Instead he met Ruth, a woman who taught him a series of exercises to ease his own suffering and manifest his greatest desires. Her final mandate was that he keep his heart open and teach these techniques to others. She gave him his first glimpse of the unique relationship between the brain and the heart. Doty would go on to put Ruth's practices to work with extraordinary results--power and wealth that he could only imagine as a twelve-year-old, riding his orange Sting-Ray bike. But he neglects Ruth's most important lesson, to keep his heart open, with disastrous results--until he has the opportunity to make a spectacular charitable contribution that will virtually ruin him. 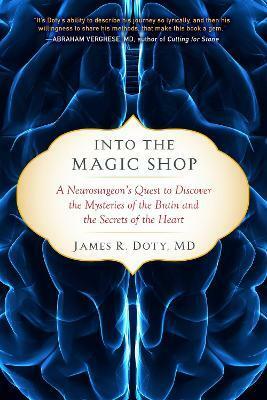 Part memoir, part science, part inspiration, and part practical instruction, Into the Magic Shop shows us how we can fundamentally change our lives by first changing our brains and our hearts. --Abraham Verghese, MD, Author of Cutting for Stone "This book tells the remarkable story of a neurosurgeon's quest to unravel the mystery of the link between our brains and our hearts. From the moment in his childhood when a simple act of kindness changed the course of his own life to his founding a center to study compassion at Stanford University. Jim Doty's life illustrates how each of us can make a difference. We can make the world a more compassionate place. I'm sure many readers will be moved by this inspiring story to open their hearts and see what they too can do for others."